There is no wrong or right answer. What is most important is that a leader understands that he must grow. Why? Because leadership is a multidimensional discipline which takes a lifetime to master. And if you don't grow as a leader, people will not follow you. Tim Koschella understands that leadership is not a singular moment. It is a series of small seemingly insignificant steps. This is especially true when it comes to nurturing a startup. The very nature of the organization is unlike any other, and it is designed to test your leadership. 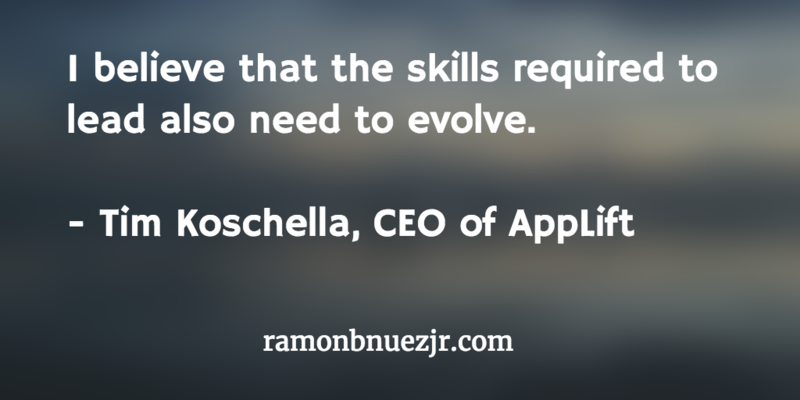 Koschella explains, "I believe that the skills required to lead also need to evolve." And how is that done? You might say that experience is the best teacher, but in truth, experience alone is a pretty awful teacher. The best teacher is an evaluated experience. You can't just do something repeatedly and assume you will get better. To improve as a leader, you need to take the time and carefully evaluate, observe, take note, and make the appropriate adjustments. Tim Koschella, CEO of AppLift, spends significant time evaluating his leadership because Tim understands that everything rises and falls on leadership. 1. So Tim, what's your story? I was born in Germany, but after just a few months my parents moved to Nigeria where my father worked as a researcher. I stayed in Africa for 10 years before our family moved back to Frankfurt. I studied economics and business administration and held various internships. It was through my experience in the workforce that I realized the corporate world was not for me and made the decision not to accept a well-paid and safe position, and instead founded my first company, an eLearning platform (lecturio.de). After the initial struggles we had to overcome, my co-founder and I managed to bring the company to break-even status with a small 6-digit VC investment and a lot of hard work. The excitement and satisfaction I felt while building this company changed my life in such a way that I never went back to considering a regular job ever again. Following, I moved to Berlin – often-called the Silicon Valley of Europe, or Silicon Allee (German Silicon Valley) – and founded a new company with two partners. We had all gone through the experience of being first-time founders once before, so our goal was to provide entrepreneurs with a platform that would help them get their business started faster, with less risk of failure, and more fun along the way. This is where HitFox Group was born, and AppLift emerged as one of the first ideas we created within HitFox Group, in the spring of 2012. I was excited by the enormous potential I saw in the mobile revolution and the role savvy ad technology companies could play in that market, which would eventually change the entire consumer Internet landscape as it existed back then. Today, we can see that many of the predictions about the mobile revolution have been outperformed by their actual development, and I'm happy that AppLift has been able to leverage that amazing opportunity and even outgrow the market. Right now, my life still centers around entrepreneurship. But at the same time, through my experience of building AppLift, I have developed a true passion for mobile and advertising technology. 2. Why should leaders lead? And when they do, what is their first responsibility? I believe leaders have a lot of different functions and responsibilities within an organization or social group. But probably one of the most important functions is to provide a constant, central core that lets the group around them follow a common goal. At AppLift, the number of employees has increased extremely fast, from 80 at the end of 2014 up to 240 today, and offering this stability is key to the sustainability of this growth. In many organizations, leadership is not such a central topic as it is for startups. Take public administration as an example. Everything is defined by clear guidelines and processes. There is no visionary goal; no higher ambition that the organization strives for. The need for and value of a leader in such a setup is relatively small. In contrast, a startup is an extremely fast-changing, unstable, yet ambitious and visionary organization. Leaders are key to such organizations to help evolve and foster a common culture, strive for a common goal and vision, and overcome obstacles. Strengthening a common vision is especially important when you are building a global organization with seven offices across three continents. This was particularly challenging last May, when we acquired Bidstalk, a 50-person Singapore and Bangalore-based adtech company. Although their culture and values were similar to ours, we still had to infuse our vision and align the teams quickly to create value out of the merger in this very competitive industry. As we continue to expand into new markets (we will open an office in NYC later this year), this core of common values and vision will prove essential to our success. I truly believe that the first responsibility of leaders is to ensure that the organization or group of people is developing to their full potential to fulfill a common goal. This can mean a lot of things beyond just providing guidance. It can mean providing emotional stability in difficult times or thinking beyond the obvious path to pursue. In a startup environment, emotional stability is something that is extremely important. The frequent ups and downs the organization undergoes along the way and the impact that has on the team is something that can be very destabilizing if handled in the wrong way. Also, I believe leaders should take responsibility for the actions of their organization, not only their individual actions. This can be extremely hard to accept at times. Last but not least, leaders should also protect the organization from negative outside influences and ensure the loyalty of their team. In a startup, you sometimes even need to protect your organization from the influence of its closest stakeholders (e.g., shareholders), which knowingly or unknowingly can sometimes threaten the team's ability to reach its goals. 3. How does a leader build trust? I strongly believe in leading by example. I don’t think you can expect your team to do things you're not willing to demonstrate yourself. It might sound like an anachronistic stereotype, but in my experience the best organizations are those where the leaders work the hardest. If you expect your engineering team to do a weekend shift for an important deployment, you have to demonstrate that commitment first. However, there are more parts in this mosaic. Building trust means acting according to the company's values. It means consistency between what you promise and what you do. If you promote “cost efficiency” as a value but take a first class plane ticket for $10k for a business trip, this is simply wrong. It also means you need to get people to buy into your personal promise, for which two things are important: First, they need to trust your integrity. Second, they need to be convinced that you are the actual decision maker. In this regard, comparing startups to corporations can provide an interesting perspective. If you are a leader in the corporate world, chances are you are not the final decision maker. How can your team be sure that what you promise will happen if there are too many dependencies on other decision makers in the company? You could be extremely honest, yet this doesn't build trust if your team knows you don't have decision power. In a startup, being a leader and shareholder at the same time usually offers much more credibility on this point, eventually making it easier for you to build trust. 4. How are you making things better for the people who you lead? I guess you should ask my team for an unbiased opinion, but it's very important for me to show at all times that I'm 200 percent dedicated to the company and its people, and that nothing can compromise that. At AppLift, we care about providing people with a work environment that is both fun and professionally challenging. I believe you have to get out of your comfort zone in order to improve yourself and evolve from the status quo. We do that a lot. If you look at our team, most of the people (including myself) joined AppLift very early in their careers, either straight out of university or after their first job. The nice thing about being in an emerging industry is that there are not too many people who can claim “been there, done that.” This puts smart, ambitious, yet inexperienced people at equal level with more experienced candidates (at least for certain roles). In other words, it opens up opportunities for individuals to take huge responsibilities and prove themselves. Regardless of whether they fail or not, what each person benefits from is learnings and experiences for the future. By making AppLift grow and achieve our company goals, we create more opportunities for people to grow with us. We’ve seen employees evolve from a business role to become top engineers. Or from an internship to a C-level position. Clearly those are exceptional cases, but it shows that if you provide the right environment for talented people, good things can happen. 5. What are you currently doing to develop your leadership? 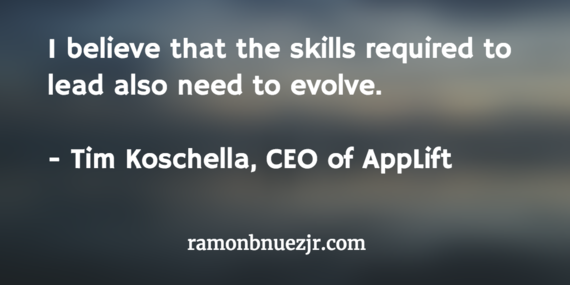 As the organization grows, I believe that the skills required to lead also need to evolve. We plan to double our headcount by the end of the year, and it doesn't take the same skill set to lead a 20-person company as it does to manage a 400-person organization. As you add on levels of hierarchy, it becomes increasingly difficult to "take the pulse" of the company, gauge whether employees are happy, etc., even if you have a very good reporting structure. Additionally, it can be difficult for the founder to let go and accept the fact that you can't control everything and need to let some parts of the organization live on their own. I make sure to know employees at all levels by scheduling coffee breaks and lunches. Leadership is one of those rare skills that you can't learn just by practicing more. I know there is a big discussion among researchers on whether leadership is an inherited trait or a learned skill; I believe it's a bit of both. Certainly, bringing the right preconditions to the game will help you to be a leader. However, in essence, it's all about the experiences you make along the way, both inside and outside of the job. It's about the people you get to work with and what you learn from them, the situations and challenges you face in your life and the experiences you make in solving – or sometimes failing to solve – them. In many ways, I still feel that I'm at an early stage in my career, trying to put together pieces of the puzzle. Therefore, I continue to observe, learn and listen to improve as a leader. Every day will get me a bit further ahead. I also believe that getting open feedback is very important. Traditionally, the bigger your organization grows, the less frequent, honest and direct the feedback becomes. You need to ask for it and encourage people who are willing to provide it. I value that a lot. Last year, we managed to break the $100 million run-rate mark, and I believe that upholding and fostering the values of honesty, transparency and direct feedback were key to getting us where we are now and to continuing our successes in the future. Read also: The Leadership Game Plan: How Jeff Walpole Of Phase2 Builds Trust. Visit ramonbnuezjr.com for more content like this + to sign up for my newsletter and receive a free copy of my e-book "The Ultimate Guide To Living On Purpose," about how to live your life on purpose.